Super Savings Item! Free Shipping Included! 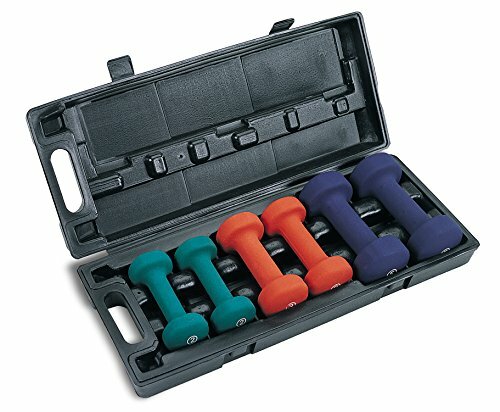 Save 37% on the Marcy Neoprene Dumbbell Set (3 Pairs) with Carrying Case NDS-21.1 by Marcy at Strongman Pictures. MPN: NDS-21.1. Hurry! Limited time offer. Offer valid only while supplies last. PREMIUM NEOPRENE CONSTRUCTION - Build to facilitate weightlifting and bodybuilding sessions, this dumbbell set boasts a high-quality slip-resistant neoprene covering. Its soft and textured surface ensures that the gear won't slip, even in sweaty hands. NON-SLIP HANDLES FOR IMPROVED GRIP - Each dumbbell features a slip-resistant handgrip made of neoprene that's designed to enhance grip during lifting. The easy-to-grip bar facilitates precise contact of your hand with the surface for a superior hold. 3 DIFFERENT WEIGHTS - Customize your training with this workout gear that includes two 2lb, two 3lb, and two 5lb dumbbells. The weights are ideal for both first-time users and seasoned users who are looking for convenient and reliable exercise equipment. COMPACT CARRYING CASE - Since the Marcy Dumbbell Set comes with a carrying case, organizing your gym equipment after working out does not have to be excruciating. Its wide surface provides enough room for your gear, providing easy and convenient storage. GREAT WORKOUT ACCESSORY - Pair it with weight benches, cardio bikes, or home gym system to achieve your ultimate fitness goal. It comes with a 2-year limited warranty to let you get the most of your investment.